The Perspective collection is made up of delicate frames named after types of clouds. 4 other ladies in my office tried on my Nimbus frames, and I kid you not, they all looked incredible. 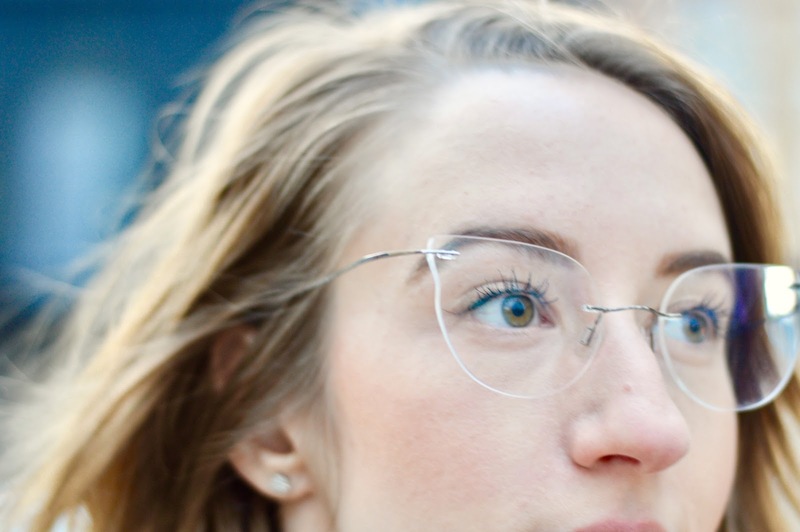 Light-as-a-cloud and so incredibly chic, I am head over heels for these glasses. The fit was a bit wonky when they first arrived, as one side sat higher than the other (due to my unbalanced ear height) and the nose pads weren't totally straight. In approx. 5 minutes, my favourite optician Maria at Clearly on Queen St. W in Toronto adjusted the arms and nose pads, then cleaned my lenses to perfection. 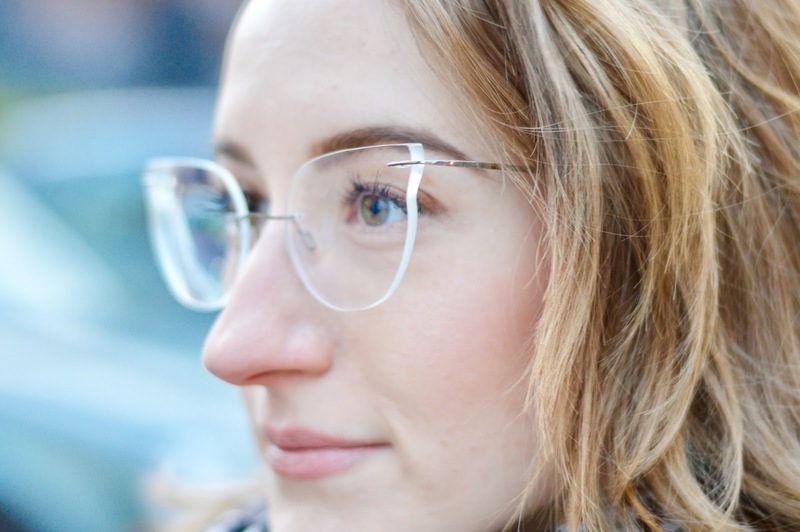 All of the glasses I had previously tried on with nose pads were very wide with shiny titanium frames, and most of the plastic frames (aside from these) just looked cheap. I hate having brand names scattered across my face, so the department store options were quickly knocked off the list. 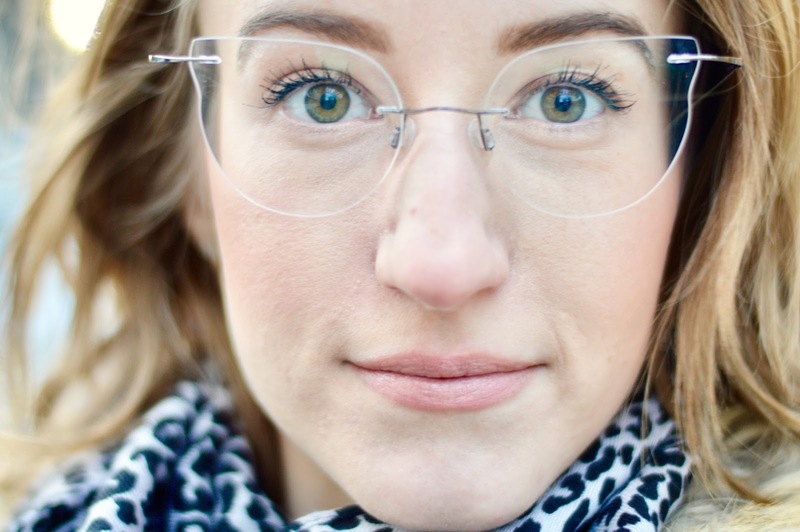 These Clearly frames are $95 and with all the fixings (anti-glare, thin air lenses) they come to $150, depending on your prescription. O.m.g. I was SO close to buying a pair of tortoise shell DKNY glasses from Sears Optical (which is way better than The Bay, by the way) that would have cost me $250. Now I can spend $150 for my glasses, and have an extra $100 to put towards my contacts! Clearly was recently bought out by Essilor, a French lens manufacturer with over 150 years of experience in the industry. I'm not sure if their lenses have improved that much, but what I do know is that Clearly has recently provided me with amazing customer service, especially in-store. I love a realistic employee who cares about what they do. Kourt, at Clearly on Queen St. was a gem to work with. 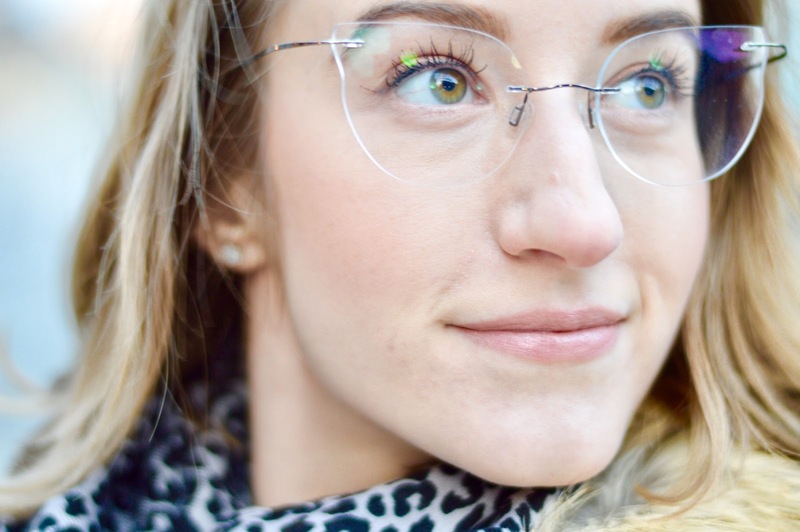 She gave me great advice, and the whole team didn't hesitate to provide feedback on frame styles and lens options to fit my needs. 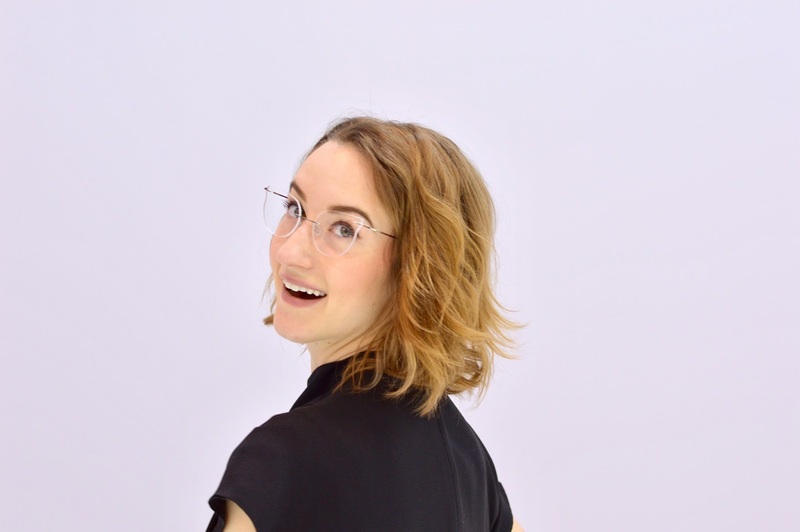 I also realized that the staff at Clearly can provide simple vision tests for $90, and my recent contact lens assessment and fitting was highly efficient at only $30. 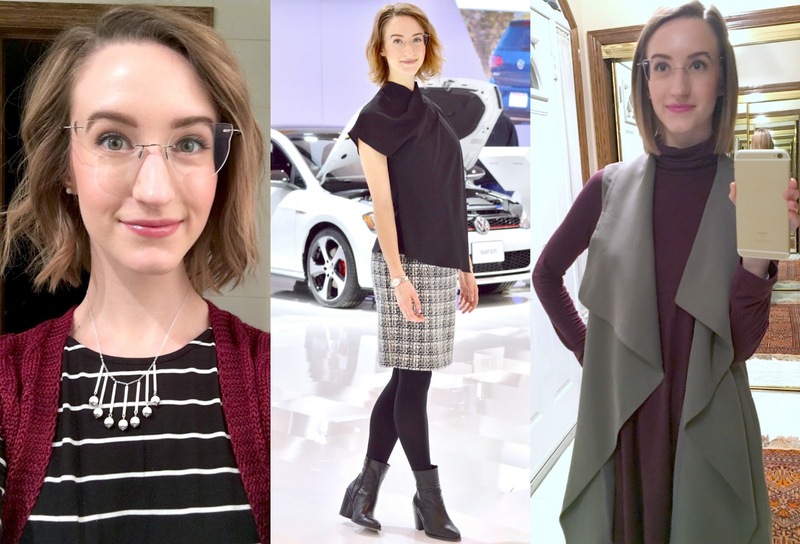 For someone who likes fashion, doesn't want to commit to 1 pair of glasses for 2 full years, and requires contacts in addition to frames, I'm not interested in shopping from independent eye boutiques. They aren't designed to fit my lifestyle, given the immense markup for designer frames. The only downside to these glasses could be the fragility. You also need to go in-store to get these frames properly shaped to your face, though that doesn't change from one retailer to another. The nose pads on Perspective frames can be adjusted by hand, but don't be rough since too much pressure could warp the thin metal or crack the lenses. Oh, and fingerprints. My Nimbus frames are easily dirtied since there's no bumper of a frame to hold onto when moving them on and off of the face. Fortunately, no frame means that they're very easy to clean with a soft cloth, and just a touch of gentle dish soap will remove any trace of oil.